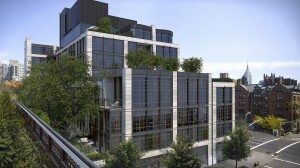 500 West 21st Street is putting the “wood” in Sherwood Equities. Or at least, the single stand of 40-foot trees. 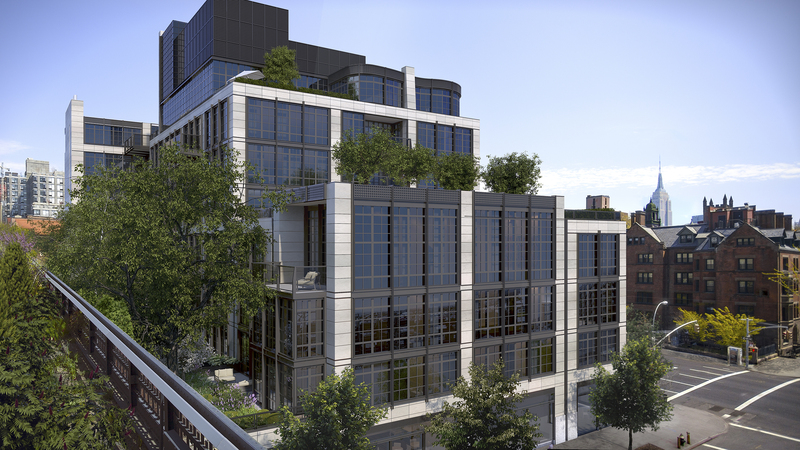 Jeffrey Katz’s latest project is under construction in West Chelsea. Last week, the frames of the first three stories were in place. But the 32 condominiums are already approximately 60 percent sold, according to Steven Novick of Sherwood, sales director for the project. Sales stared in February. Part of that success may be the work of the spacious, stand-alone sales center, just around the corner from the construction site. Potential buyers can visit working kitchens and bathrooms, complete with custom-designed brass bathroom fixtures, view a meticulously fabricated scale model of the apartment building, and take in a 30-foot wall mural that gives a taste the experience of those trees. “We want to create as close a representation to what people will be buying and living in as possible,” Novick said. The units range in size from approximately 1,050 to 4,000 s/f, and more than half include outdoor space in the form of a terrace or balcony. Prices range from $2.3 million to $6.45 million. The Kohn Pederson Fox-designed building will rise eight stories between the High Line Park and the General Theological Seminary. The property abuts the attractive but very public High Line, which is where the trees come in. elevated to the second floor, which is the first residential floor. Unlike the numerous private terraces and balconies, this will be a look-but-don’t-touch amenity for residents. The only people who will walk in the garden will be staff from Robert Reese + Partners, the landscape designers who will create and maintain the garden. The fully-grown trees are tagged and ready to go in nurseries in Long Island and New Jersey, according to Blanca Lopez, a sales associate with Corcoran Sunshine, the exclusive sales and marketing agent for the building. The tallest trees will reach to a point between the fifth and sixth floors, and additional rows of smaller trees are intended to create a dense layer of green between the lower condos and the park. As for the building, the design evokes “early twentieth century Europe with a New York industrial twist,” Lopez said. The eastern face of the limestone facade will stretch along an entire block on Tenth Avenue. Visualizing the building in context, “it almost feels like it was always there,” she said. The model of the building in the sales center shows the garden and building in minute detail. It was created by Kennedy Fabrications and Architectural Models with input from all of the stakeholders in the building, according to Novik. Presenting the model to visitors, Lopez uses a wireless table computer to illuminate individual units. 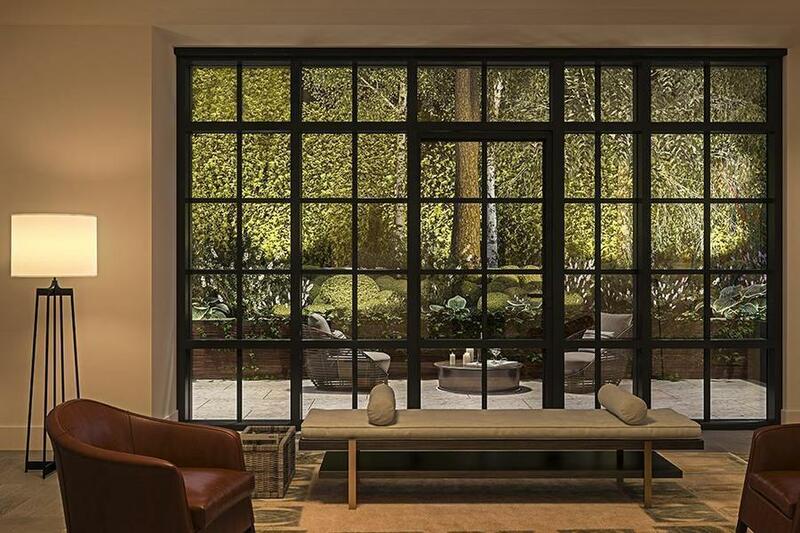 Mark Zeff, a Chelsea-based designer, is responsible for the interior of the building. The apartment doors will be made of oak and stained to a dark walnut brown. Inside, the floors will also be oak, laid out in an oversized parquet pattern and engineered for durability and a long life. The kitchens will be spacious, will lots of storage space and handsome counters of hewn, rather than polished, marble mined in Vermont. The master bathrooms will have oversized walk-in showers and radiant heated floors, and in most residences also have freestanding soaking tubs. All the bathrooms and toilets will be equipped with Toto appliances and custom brass fixtures. An on-site parking garage will have nine parking spaces available for rent by residents. Other amenities include a children’s’ play room, a professionally managed fitness center and a media and entertainment lounge. In another important touch for the modern world, there will also be a roof-mounted emergency generator and integrated flood wall panels. The development’s context in an up-and-coming, art- and design-focused neighborhood is also a selling point. The nearby entrance to the High Line is a particularly appealing feature for the parents of students at Avenues: The World School. Which residents of 500 West 21st Street will be able to reach the popular private school by walking through the elevated park. Just inside the sales center, opposite the garden mural, hangs a brass recreation of the street grid, approximately 18 feet high. Local attractions – art galleries, shopping, Chelsea Piers, a yoga studio – are numbered and indexed to a key painted on the wall. The map itself is a work of art. It was Zeff’s idea, Novick said, and while he was at first skeptical he changed his mind when he saw the way the extra effort paid off. “We wanted it to be more artsy, given that we’re in West Chelsea, than just a Google map on the wall,” he said.